Are state and local economic incentives to attract new firms worthwhile? Mitsubishi Motors in Illinois provides in-depth analysis of the incentives offered to land Diamond-Star Motors, the plant's labor force, supplier organization, and its community impact to answer this question. The authors conclude with a benefit-cost analysis of the incentive package at the community and at the state level. Written in nontechnical language, the book is intended for planners and administrators in state and local government, economic and business development officers, and international corporate management, as well as economists and public policy analysts. 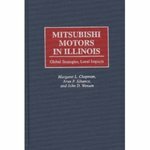 Chapman, Margaret L., "Mitsubishi Motors in Illinois: Global Strategies, Local Impacts" (1995). IWU Authors Bookshelf. 65.